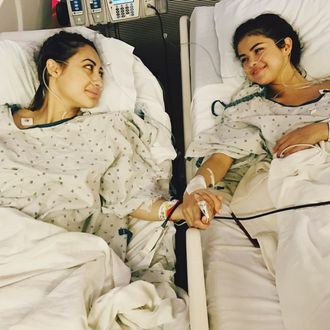 Selena Gomez (right), with her friend and kidney donor Francia Raisa. On Thursday, Selena Gomez revealed on Instagram that recently had to undergo a kidney transplant operation because of lupus. The singer posted an image of herself in a hospital bed, holding the hand of her friend (and kidney donor) Francia Raisa, explaining that the procedure is why she has been lying low most of the summer. Gomez first opened up about her battle against the serious illness back in October 2015, after she took some time off from music to go through chemotherapy. Since then, the former Disney star has also spoken out about the depression, anxiety, and panic she has apparently suffered as a side effect of lupus, which she says prompted her to check into a psychiatric facility in Tennessee last summer. So I found out I needed to get a kidney transplant due to my Lupus and was recovering. It was what I needed to do for my overall health. I honestly look forward to sharing with you, soon my journey through these past several months as I have always wanted to do with you. Until then I want to publicly thank my family and incredible team of doctors for everything they have done for me prior to and post-surgery.